The WhoDunIt Suite consists of 3 programs to provide in-depth notification of who was responsible for creating/changing/deleting your files and folders. The first two programs, WhoDunItHostEnable and WhoDunItObjectEnable, are solely for the purpose of enabling the Audit functions necessary to support such in-depth notifications. The 3rd program WhoDunIt extracts the Audit information from the Security Log. You've Got Files! Corporate and Demo versions 2.427 and greater are capable of driving WhoDunItObjectEnable to enable auditing on monitored folders and driving WhoDunIt to retrieve Audit information and include it in email change notification. WhoDunItHostEnable is to be run on the machine that you are planning to audit. WhoDunItHostEnable is to be run with Administrator privileges. Start WhoDunItHostEnable by double-clicking on WhoDunItHostEnable.exe. Do Host Enable: Clicking on this button will run the Host Enable function. Once you see the 2 "SUCCESS:" messages, auditing is enabled. WhoDunItHostEnable turns off simple file sharing as you would do within Windows Explorer->Tools->Folder Options->View, and enables Auditing as you would do within Local Security Policy->Audit Policy->Audit Object Access. 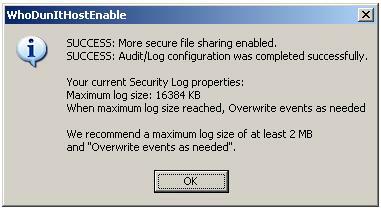 The current settings of Event Viewer's Security Log is also displayed. We recommend the Security Log be set to at least 2 megabytes and "Overwrite Events As Needed" You have control over these settings from within the Event Viewer->Security->Properties window. Undo Host Enable: Clicking on this button will undo the Host Enable function. You may manually disable auditing within Local Security Policy->Audit Policy->Audit Object Access. WhoDunItHostEnable will always write a log file WhoDunItHostEnable.log of operations performed in the SystemRoot directory. SUCCESS: More secure file sharing enabled. SUCCESS: Audit/Log configuration was completed successfully. and "Overwrite events as needed". WhoDunItObjectEnable is a command line program. for output from the program to be written to. The program turns on Auditing for an Object, similar to the manual operation of using Windows Explorer to select a folder, then Properties->Security->Advanced->Auditing. stdout) will be "SUCCESS=1" or "SUCCESS=0" to indicate success or failure. X is one of the exit codes shown above. additional output to the You've Got Files! runlog.txt file. those errors are written to the You've Got Files! runlog.txt file. previously enabled. This can be accomplished from within You've Got Files! that You've Got Files! is started, it will clear all auditing for that file object. "-SUCCESS" or "-FAILURE" auditing commands as shown above. WhoDunIt is a command line program. You've Got Files! runs the program when it has determined that a file/folder notification is to be sent. The path to the notification object is passed to WhoDunIt, WhoDunIt queries the Security Log of the monitored machine and returns the relevant Security Log information. You've Got Files! includes the returned Security Log information with the You've Got Files! email notification. The "PID123.txt" file is the name of the output file (use any name you wish). If you are using WhoDunIt from the command line, then this file will actually be created in a directory called "WhoDunIt" at the location where the program is run. Optionally you may append " -all" (space character before the dash) to the command when calling WhoDunIt, and more verbose Security Log information will be written to the output file. Command line users of WhoDunIt are responsible for deleting/managing the output files created. The WhoDunIt configuration file is named WhoDunItconf.txt and is found in the WhoDunIt installation directory. After the 30 day demo period, WhoDunIt will no longer run unless a valid serial number from Niwot Networks Inc. is obtained and entered into WhoDunItconf.txt. 1. From the Control Panel, run "Add/Remove Programs" and select WhoDunIt from the bottom of the list to remove. 1. WhoDunItObjectEnable: Reduced quantity of messages written to log. 2. WhoDunIt: Reduced quantity of information reported in abbreviated ouput (no change to -all). 3. WhoDunIt: If 'Client User Name' is "-" (dash), then display 'Primary User Name' instead. 1. Addition of expiration messages for WhoDunit.exe and WhoDunItObjectEnable.exe. 2. Use correct permission levels when requesting data from remote servers with WhoDunIt.exe. 3. Handle -CLEARALL accurately with WhoDunItObjectEnable.exe. 1. Initial release June 2007. FOR WhoDunIt (tm) WhoDunIt.exe (tm), WhoDunItHostEnable (tm), and WhoDunItObjectEnable (tm). This Niwot Networks Inc. ("Niwot") End User License Agreement (EULA) accompanies the WhoDunIt product and related explanatory materials and "online" or electronic documentation ("Software"). The term "Software" also shall include the contents of the installation package, any upgrades, modified versions or updates of the Software licensed to you by Niwot. The Software is licensed on an expiring basis, not sold. Please read this License carefully. At the end of the license term you agree to renew your license or refrain from using the software. The Software over such network; and make backup copies of The Software. without Niwot Network's prior written consent. The Software product is licensed as a single product. RISK ARISING OUT OF USE OR PERFORMANCE OF WhoDunIt REMAINS WITH YOU. Export Administration Act or any other export laws, restrictions or regulations. Niwot Networks, Inc, 721 9th Ave., Longmont, CO 80501. You've Got Files!, WhoDunIt,WhoDunIt.exe, WhoDunItHostEnable, WhoDunItObjectEnable, and youvegotfiles are trademarks of Niwot Networks, Inc.